A fresh new day and itâs ours, a day of happy beginning when two lives are made one, two halves are made whole and two friends are made husband and wife. 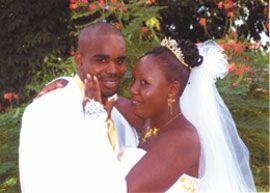 Mr. and Mrs. Gilford Noel were joined as one on the 19th of September 2009, at the Streams of Power Church, Carriere. A reception followed at Macedonia Rock Hotel.